Nevis is a stunning and tiny beautiful volcanic island covering an area of 35 square miles and has a population of just 12,000 people. It is the secret gem of the Caribbean. Whilst not entirely hidden as it is said to be one of Anna Wintour's (of Vogue magazine fame) most favoured places to go on vacation. It is still largely untouched by mass tourism. This is where you will be able to enjoy the beauty of the island mingle with the locals, drink rum punch and dance to live reggae music in some of the down to earth beach bars. There are no designer hot spots in Nevis but you will find plenty of really high quality villas and a lot of amazing restaurants which have some of the best food in the Caribbean. Nevis has a beautiful laid back authenticity that money simply cannot buy. One of the most popular spots on the island is Sunshine's Beach Bar. It is located just a couple of minutes walk along the beach from the Four Seasons Resort. No visit to Nevis would be complete without a calling in to Sunshines!. You will most likely meet Sunshine – the legendary owner and also try one of his famous Killer Bee rum punches. Be wary though as they have a pretty good sting!! The most wonderful thing about Sunshine’s is that the food is every bit as good as the atmosphere and the rum punch. One of the most distinguishing features of the island of Nevis is the actual Nevis Peak. It sores 3232 ft into the sky and the top is almost always covered in clouds. In fact the name was originally derived from the Spanish word Nieves which means snow. For the adventurous at heart, it makes for a wonderful hike. We highly recommend you take a guide and have a reasonable level of fitness before setting off. You will climb up through the most beautiful verdant green rainforest pulling yourself up on ropes. The undergrowth is very muddy and slippery so beware you will come home dirty. Although quite often there is no view from the top of the peak, you will get occasional breathtaking views of the coast and other neighbouring islands through the gaps in the forest as you climb. If the Nevis Peak climb sounds too daunting, there are plenty of other activities to keep you occupied. For a start there are many less daunting walks to enjoy. For example Saddle Hill is a much easier and has less climbing. You will still experience the beauty of the rain forest as well as some very spectacular views and if you are lucky some of the little troops of monkeys. The island is perfect for cycling. There is one road that circumvents the whole island so it is impossible to get lost. It is 36 miles in total and the views along the way are spectacular. The road surface is also pretty good which makes for good cycling and is often hard to find in the Caribbean. If you feel like some company on your cycle, Reggie Douglas is the perfect Companion. He is quite a character and has competed in the world cycling championships several times for Nevis and is also a world class tri athlete. There is also a great variety of water sports to participate in. The waters are perfect for swimming, snorkelling, diving, sailing, paddle boarding and kite surfing. For gardening enthusiasts, the Botanical Gardens of Nevis are worth visiting. They were originally created by a couple from the United Sates whose dream it was to preserve the flora and fauna of the island. They were very successful in their endeavours. There are five acres of gardens altogether, an aviary full of colourful parrots as well as a great house to explore. The Island of Nevis was originally discovered by Christopher Columbus in 1493 and has a fascinating history. The island together with the neighbouring island of St Kitts was one of the first islands in the Caribbean to be colonised. It was at one time a large producer of sugar and there are numerous plantation houses to visit. One of the most interesting of these is the remains of Hamilton Estate. This was the birthplace of Alexander Hamilton who drafted the first Constitution of the Unites States of America. Another very famous resident of Nevis was Lord Horatio Nelson. He spent much of his life living in Nevis and this is where you will find the largest collection of his relics. The capital of Nevis is Charlestown. It is located right on the water and is worth a visit. There are some really good examples of Georgian style architecture here as well as some impressive mansions. Nevis is known for its beautiful beaches, wonderful coves, lush rain forests and 18th century plantations houses. 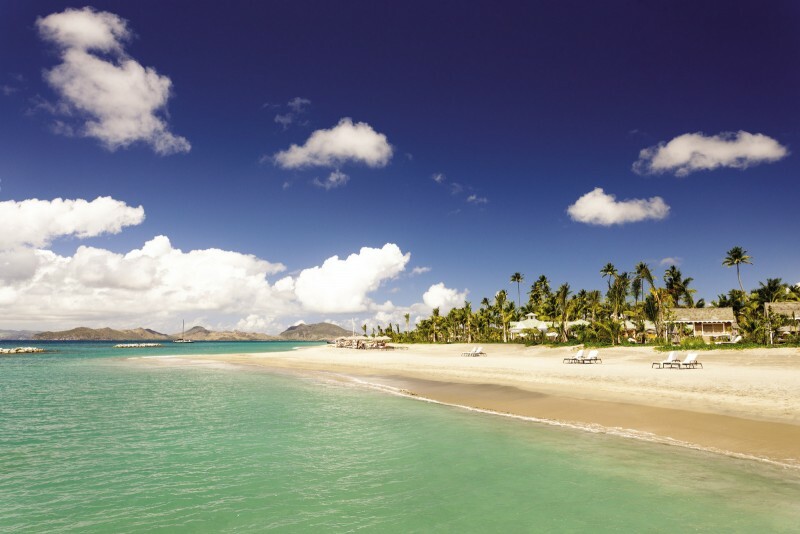 The best known and beautiful of all the beaches on Nevis is Pinney’s Beach. It stretches for miles and has white sands and beautiful translucent turquoise sea. The view inland is equally beautiful as the beautiful Nevis Peak provides the perfect backdrop. Many of our Exceptional Villas are also located along the shores of Pinney’s Beach including the stunning villas the Four Seasons Resort and Paradise Beach Resort. The island divides naturally into two halves. The south is dominated by the mountains and rain forests whilst the north is where you will find some stunning vacation rentals in Nevis and the main beach activities. One of the wonderful charms of the island is that whilst many of the vacation rentals in Nevis are of an extremely high standard, the actual island still has the wonderful charm of a more traditional Caribbean. The tiny island of Nevis is dotted with fascinating buildings, plantation houses and historical sites such as the Nelson Museum. Nevis is also stunningly beautiful with pristine beaches, botanical gardens, dramatic waterfalls, mountains and rain forests to enjoy. There is a wide range of water sports, excellent hiking and a world class 18 hole golf course at the Four Seasons resort. A hot, tropical climate tempered by trade winds most of the year. Rain showers occur year-round. These figures show monthly average maximum temperatures and monthly average rainfall for Nevis.